A story of two of the largest eggs in the world and what they reveal about the extinct elephant bird (Aepyornis maximus). That, of course, is Sir David Attenborough. In his hand is an elephant bird egg. He, and that egg are featured in a 2011 BBC documentary on Madagascar that I’ve just finished watching, called, Attenborough and the Giant Egg. In the 3-part series, Attenborough shows, through archival video, how he came to be in possession of the egg during his first visit to Madagascar in 1960, while filming an episode of the BBC TV series ZooQuest. This video clip, in which a young Attenborough receives his egg (in the form of several large pieces) and reassembles it with medical tape, is a gem worth watching. Attenborough then retraces his steps, now 50 years later, updating the audience on Madagascar today and providing more information on what is known about elephant birds and what he has learned about his egg – including its age (which I’ll get to later). I’m not going to recount the details about elephant birds here. The basics you can find on Wikipedia. For the rest I’d highly encourage you to watch the BBC production. But I do want to say that the minute I saw Attenborough’s Giant Egg, I thought, Wait! I’ve seen that egg! Ok, not that exact one, but an elephant bird egg. 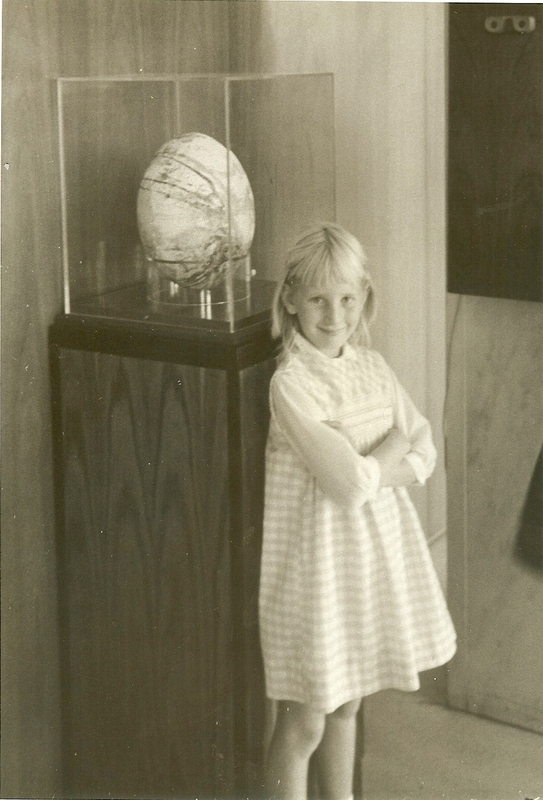 One day when I was in 4th grade, I came home from school all excited. In my Weekly Reader News Magazine was a story about the discovery of a giant egg laid by a bird called the elephant bird. Now, an enormous egg (1 foot tall!) was exciting enough, but even more exciting was this: The egg was on display at the Smithsonian. I could SEE it! So that I did. My parents took me to the Smithsonian Museum of Natural History (aren’t they the best! ), and there it was: The Egg in all of its giant awesomeness. Back then, I didn’t really know much about the elephant bird, except whatever short blurb my Weekly Reader provided. To me, the amazing part was the enormity of the egg itself, the fact that it was ancient, and that it belonged to some giant extinct bird. What else does an 8 year old need to know? 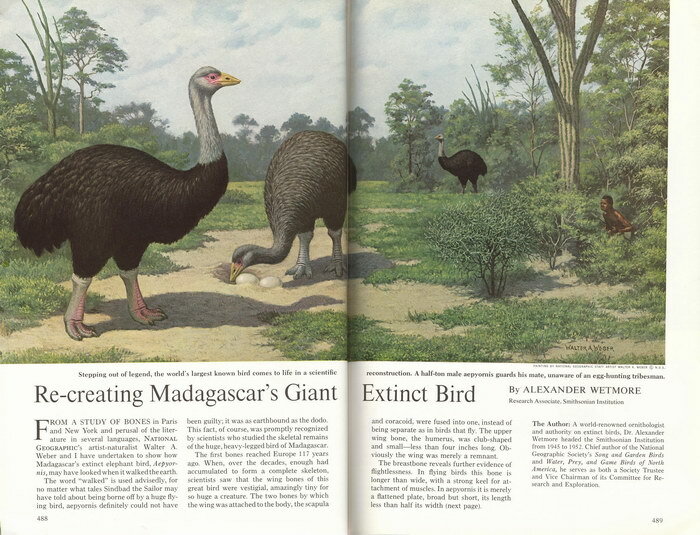 The research expedition to Madagascar and the story of the elephant bird and its eggs were featured in the October 1967 National Geographic Magazine along with a great artistic rendering of how the animal must have looked. The discovery of the intact (and Attenborough’s mostly intact) eggs was exciting. That was the big news back in the 1960’s. But today even more is known about elephant birds and their reproduction. I’ll cover just a few of the recent findings here. 50 years after collecting his egg, Attenborough had it carbon dated. Most elephant bird eggshells had been dated to around 900 years ago. 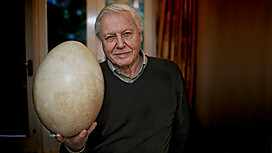 To Sir David’s surprise, his egg proved to be 1300 years old. Imagine, an eggshell lasting that long! Of course, these weren’t delicate little sparrow eggs. When you look at the video of Attenborough handling and repairing the egg, you realize how robust that shell really is. One would expect the shell to scale up, not only in size, but in shell thickness, as baby bird size increases. But it turns out, in some birds the shell thickness is correlated more strongly with the mass of the parent than with the mass of the developing chick. Well that makes sense. The parent bird has to actually sit on the egg without crushing it. But that then begs the question, how do you provide such a thick protective shell without making it so thick that chicks cannot peck their way out? This is a conundrum that probably places an upper limit on the size of birds. One way to tackle the conundrum, which may apply to the half-ton elephant birds, is for the species to have a sexual dimorphism with males being smaller. In this way, the large females can carry and lay big eggs with proportionally thin shells, but the lighter males can do the incubating, thus avoiding shell breakage. This could explain why females outweigh males in the largest of species of extant birds. It may also explain the difference in elephant bird egg sizes. Notice the one in the Smithsonian is appreciably smaller than Attenborough’s egg. It could be that the largest eggs contain the larger female chicks. We also know more about the chicks themselves today. To our astonishment and gratification, the larger of the two eggs brought back from Madagascar by the GEOGRAPHIC’s Luis Marden proved to contain the remains of a well-developed embryo. 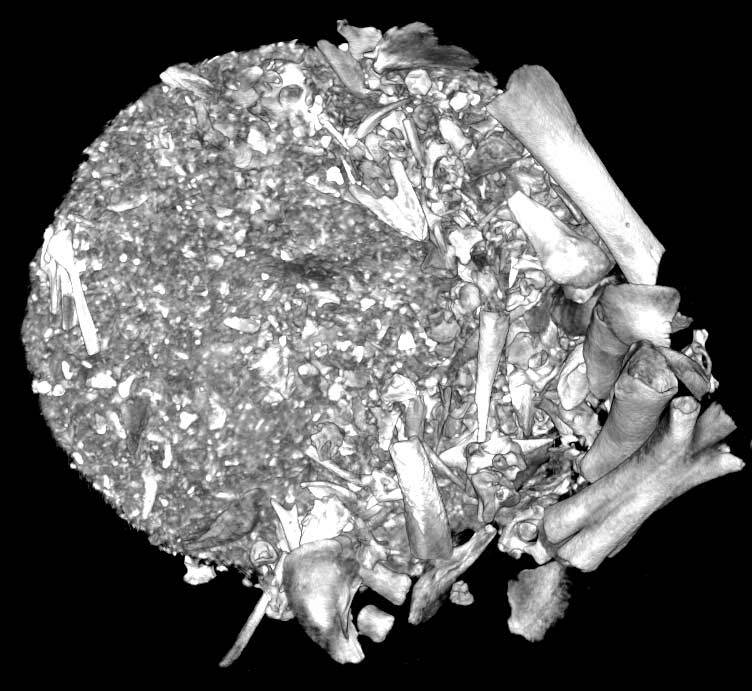 X-ray photographs clearly show bones of a chick, perhaps three-fourths developed. Stereoscopic X-ray pictures were even more eloquent and scientifically valuable. That early image was good for the time, but revealed little more than the shadows of bones. This image is the best anyone has ever had of an elephant bird embryo. The skeleton had disarticulated and settled into the bottom of the egg but with the HRCT, researchers were able to digitally isolate and identify over half of the skeleton, including the braincase, palate, rostrum, vertebral column, and both the fore- and hindlimbs. Click to view a roll animation of the reconstructed embryonic Aepyornis skull. Click to view a yaw animation of the reconstructed embryonic Aepyornis skull. One other question that’s been raised is how (or more correctly, where) the female elephant bird carries her egg. Most birds carry their eggs in the rear of their pelvic cavity. However, there is one species that carries its inordinately large egg toward the front of its body. This is the kiwi. 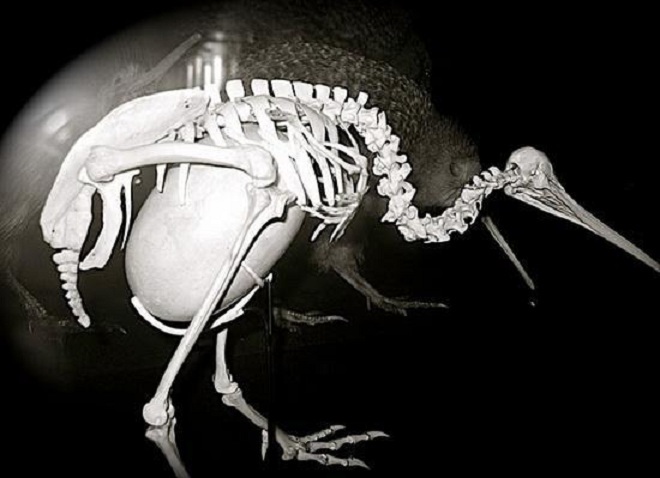 Comparisons of the pelvic bones of the elephant bird with those of other palaeognaths (kiwis, cassowaries, and emus) indicates that the elephant bird may have carried her eggs in a similar fashion to the kiwi in order to provide stable support for such a large egg. PreviousScientists: Get Out There and Inspire! NextOpen Lab 2012: Romeo Makes the Cut! You always manage to unearth such interesting stuff, and I’m always amazed at your personal connections with them all. Thanks Gwynn. I’m often amazed at the connections too. Must stem from a lifetime of collecting things, experiences, and stories. I think they all sit there and just wait for the right moment to hatch ..